This is a 9 mile loop with rolling ups and downs in the Granite Basin Recreation Area southeast of Granite Mountain. The hike goes through forest and scrub with pine and juniper trees, cactus, manzanita and shrubs of various kinds. There are no steep or sustained climbs and the hike makes use of several connecting trails. At one point on the hike a short side trail leads to a site built by ancient people in the Prescott area. Park in the dayuse day use area where there is ample parking and bathroom facilities. There is a fee except on Wednesdays when use is free and be sure to get one of the maps next to the pay station. 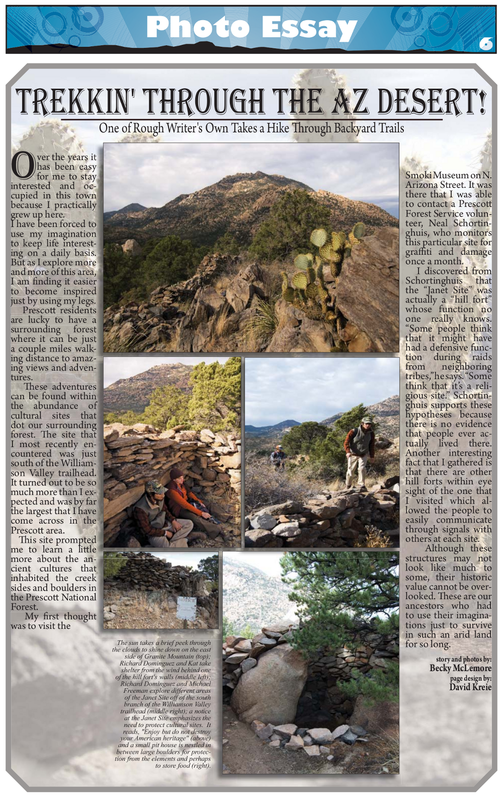 I learned about this hike in Ron Smith's book A Guide to Prescott and Central Highlands Trails, 3rd edition, and basically followed his description. To do the hike in a counterclockwise direction begin at the south end of the parking area. There is a sign for trail #346 (Willow Connector trail). After the sign immediately turn left to stay on #346 avoiding trail #349. This is a gradual uphill section with increasingly better views of Granite Mountain appearing behind you as you hike. After about .5 mile, you'll pass through a gate and shortly thereafter will come a junction with trail #347, Willow Creek Trail (N34 36.182 W112 31.762). Turn left here onto trail #347. In another 1.2 miles you'll reach a junction with trail #348, Chimbly Water Trail (N34 37.053 W112 31.999). Stay on #347 and after another 2.2 miles you'll reach the junction with trail #309 (N34 38.127 W112 31.135), a spur trail leading to Boone Court in a residential area. Stay on #347 and in another .3 miles (N34 38.309 W112 31.294) there is an unmarked spur trail to your right leading to the top of the hill. At the top of this hill is a prehistoric peoples site called the Janet Site. View this document for some additional information. This is an archaeological site and should remain undisturbed. If you do hike the .2 mile spur trail to the top of the hill to the site, please stay off the rock walls and do not move or remove anything. Anyone who damages or takes anything is subject to arrest and prosecution. Continue of trail #347 for .25 miles to the junction with trail #345, Mint Wash Trail (N34 38.483 W112 31.292). Turn left here onto trail #345 and follow it to Granite Basin Lake. There was a small brook to our right in several places which was probably draining from Granite Basin Lake. In about 1.9 miles from the junction of trails #347 and #345, you'll come to the junction with trail #352, Mint Wash Connector (N34 37.443 W112 32.446). This could be used as a shortcut back to your car. Continue on trail #345 to Granite Basin Lake. There are bathroom facilities at the near end of the parking lot. After viewing the lake return to trail #345 which takes a sharp left just before reaching the lake. Continue for another .3 miles to the end of trail #345 at trail #351, West Lake Trail (N34 36.900 W112 32.766). Turn left here onto #351. In another .5 miles you'll pass the junction with trail #348 (N34 36.719 W112 32.360), but continue on #351 back to the Cayuse parking area in another .5 miles. When entering Prescott stay right on SR89 which is Sheldon St. Follow Sheldon St. to the 'T' intersection at Montezuma St. and turn right. Montezuma turns into Whipple which turns into Iron Springs Rd. (St Rt 10). Continue on this road. At about the 3.5 mile mark turn right on FR 374( You will see the brown recreation sign marking the Granite Basin Day Use area including the Metate Trailhead.) Follow the road about 2.0 miles back to the Day Use parking area on the right just past the Yavapai Campground on the left.